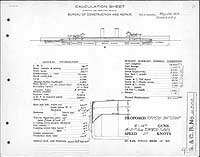 Preliminary design plan prepared by the Bureau of Construction & Repair, probably in support of studies of this potential new ship type that were taking place at the Naval War College at about this time. The so-called Torpedo Battleship, conceived as a large ship armed primarily with torpedoes, never found substantial support. The Bureau of Construction & Repair recommended in 1911 that such a ship be included in the Fiscal Year 1913 program. None were built or planned for construction, however. 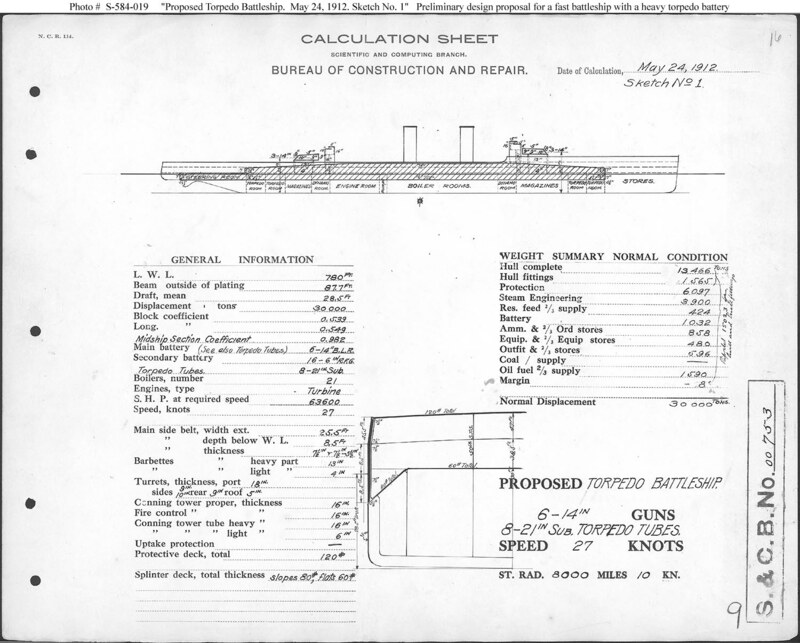 This plan, labeled Sketch No.1, provides six 14-inch guns in two triple turrets, eight submerged 21-inch torpedo tubes, and machinery for 27 knots maximum speed in a ship 780 feet long on the load water line (L.W.L. ), 87.7 feet in beam, with a normal displacement of 30,000 tons.